Comments Off on Bruins get Knighted in North Kawartha! Bruins get Knighted in North Kawartha! Despite some great saves by Jake Joosten the Bruins fall behind 2-0 in the first. Uxbridge battled back to tie and then take a 4-3 lead in the third. Simon Feig brought the puck up the ice and circled the net before passing off to Cristian Giorgio and on the return pass moved in from the point and fired a rocket pass the Knights goalie. 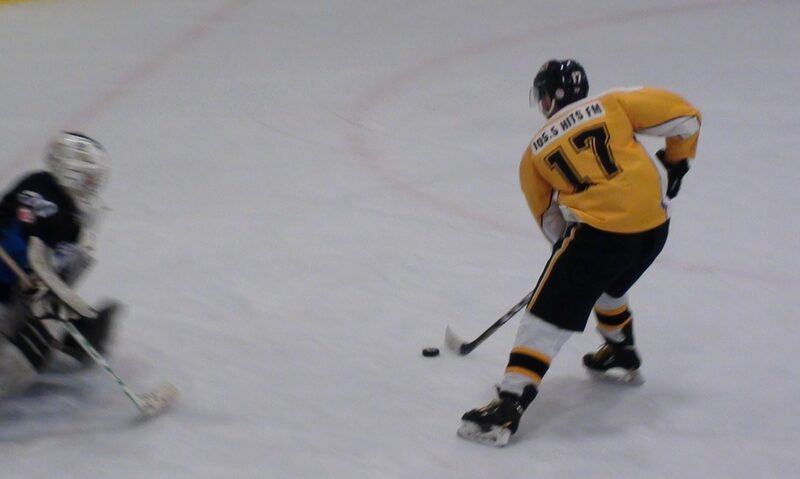 Damien Heinle tied it up at 2-2 when he took a pass from Liam Timewell on a 2 on 1 and deked North Kawartha’s tender. After the Knights regained the lead, Ryan Dunlop with his first Junior C goal knotted the game at 3-3 with a wicked point shot and Jack Schnalzer picked up a loose puck off the faceoff and walked in to give Uxbridge their first lead of the night 4-3. But North Kawartha came back to take a 6-4 win including an EN goal. Uxbridge plays in Clarington on Thursday Nov.3 at 7:20 pm. Comments Off on Another Lead Vanquishes against Port Perry! Another Lead Vanquishes against Port Perry! The Bruins opened up leads of 2-0 and 3-1 over the Mojacks tonight but a 4 goal outburst in the third gave Port Perry a 5-3 win over Uxbridge. Adam Bartholomew scored in the first for a 1-0 lead when he fired a hard shot that eluded the Mojacks goalie. Then in the second it was Justin Aikins upping the score to 2-0 Bruins when he fired on his off wing on the goalies stick side. Bartholomew got his second of the night for a 3-1 lead after two periods of play, however the Mojacks stormed out of the gate in the third to skate away with a 5-3 win and remain undefeated at 12-0. Uxbridge host the North Kawartha Knights on Friday Nov.4th at 7:45pm, They are in Apsley sat Oct.29th for a 7:25 pm game against the Knights. Comments Off on Bruins Squander 3 goal lead but Win it in Overtime! Bruins Squander 3 goal lead but Win it in Overtime! It started out ok as the Bruins led 3-2 after one on goals by Jack Schnalzer, Adam Bartholomew and Justin Aikens. Schnalzer and Derek Dolan were sent in all alone by Nick Sribny and they passed back and forth before Schnalzer tied the game at 1-1. They upped that lead to 6-3 in the second with Uxbridge goals by Marshall Lockhart who also scored on a breakaway from Dolan, then Simon Feig and Liam Timewell finished out the scoring. The third was a complete meltdown allowing the Ice to storm back and take a 7-6 lead before Patrick Bolahood scored the first of 2 big goals to save the night. With Bruins goalie Ryan McConkey on the bench for an extra attacker, Brady Bakers initial shot rebounded to Bolahood and he fired home the tying goal. Then Bolahood went coast to coast firing the winner in overtime. Bruins host the Port Perry Mojacks this Friday Oct.28th at 7:45pm. Comments Off on Exciting OT Win for the Bruins at the Bear Den! Exciting OT Win for the Bruins at the Bear Den! If you weren’t at the arena tonight you missed an exciting finish as Adam Bartholomew buried a breakaway goal in the 3 on 3 overtime period giving his team a 3-2 victory over the Little Britain Merchants. Bartholomew blocked a shot along the neutral ice zone and raced in with the puck beating the Merchants goalie on the blocker side just 47 secs in and sending the fans into jubilation. Coby Gardner got the Bruins on the board in the first with a nifty pass from Damien Heinle just 1:21 into the game but the Merchants tied it up at the midway point of the first. It stayed that way till the third when Little Britain took a 2-1 lead only to have the Bruins Heinle tie it up 36 seconds later. Jake Joosten picked up the win in goal making 42 saves, the Bruins fired 31 the other way. Next Game is this Tuesday Oct.25th vs the Georgian Ice at 7:45pm. Comments Off on Bruins Can’t Hold Lead in Port! Bruins Can’t Hold Lead in Port! The Uxbridge Bruins jumped out into a 3-0 lead in the first period but the Mojacks got one back to end the first period down 3-1. Scoring for Uxbridge was Jack Schnalzer (first Junior C goal), Brady Baker and Damien Heinle. The Mojacks got another one in the second but the Bruins still had a 3-2 lead after two. In the third Port tied the game and took a short lived lead before Schnalzer got his second of the afternoon. Port Perry sealed the win with just over 5 mins remaining for a 5-4 win and remain undefeated this season at 9-0. Ryan McConkey took the loss in the Bruins net, Next up is Little Britain at the arena Fri. Oct.21st at 7:45 pm. Comments Off on Bruins Claw Back at the Eagles for the Win! Bruins Claw Back at the Eagles for the Win! (Videographer Jaiden Irven: Jake Joosten with a save in the third Period). 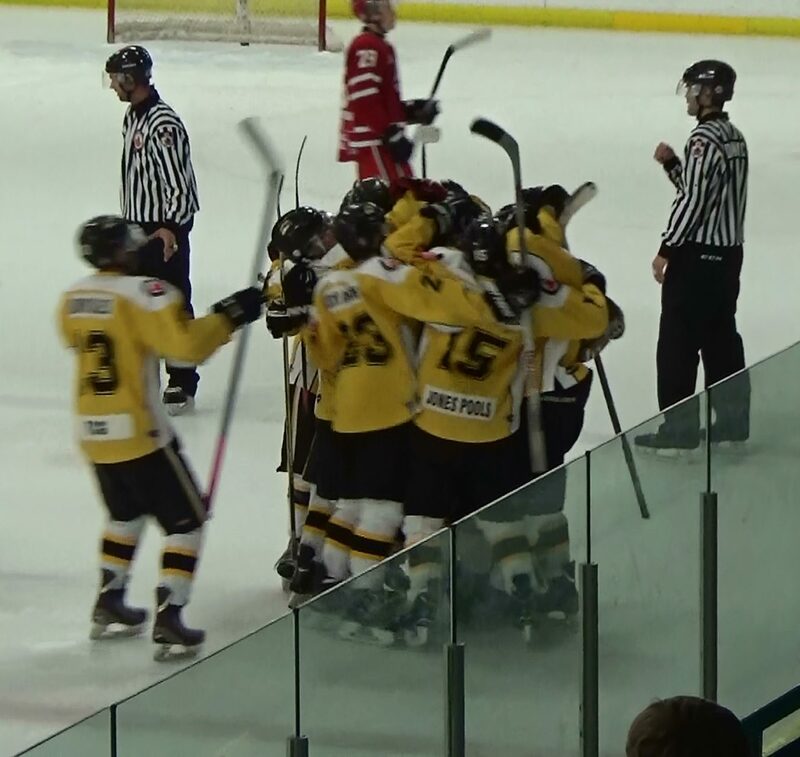 Clarington got on the board first with a 1-0 lead in the first period but it was the Bruins who came out soaring in the second as they scored two for a 2-1 lead. First it was Derek Dolan on a powerplay from Cristian Giorgio and Brady Baker, followed just over a minute later by Marshall Lockhart from Giorgio at the 3:49 mark. In the third period Jackson Evans picking up his first junior C goal for the insurance marker and a 3-1 win over the Eagles. 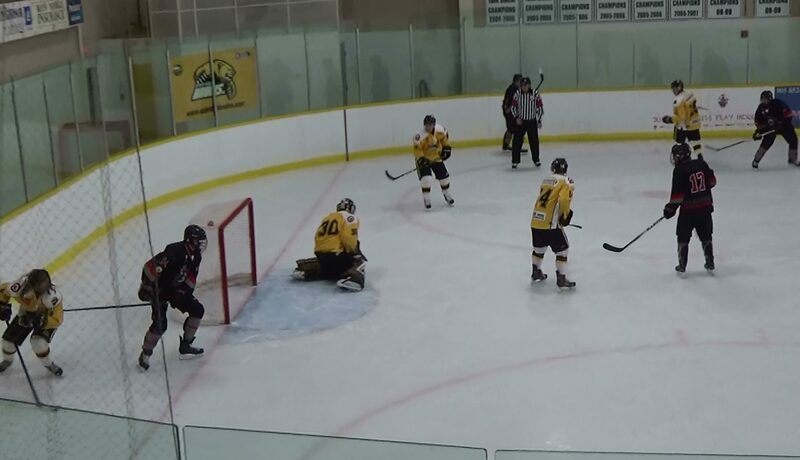 Jake Joosten stood tall in goal as he faced 38 shots on the night and the Bruins fired 32 at the Clarington net. 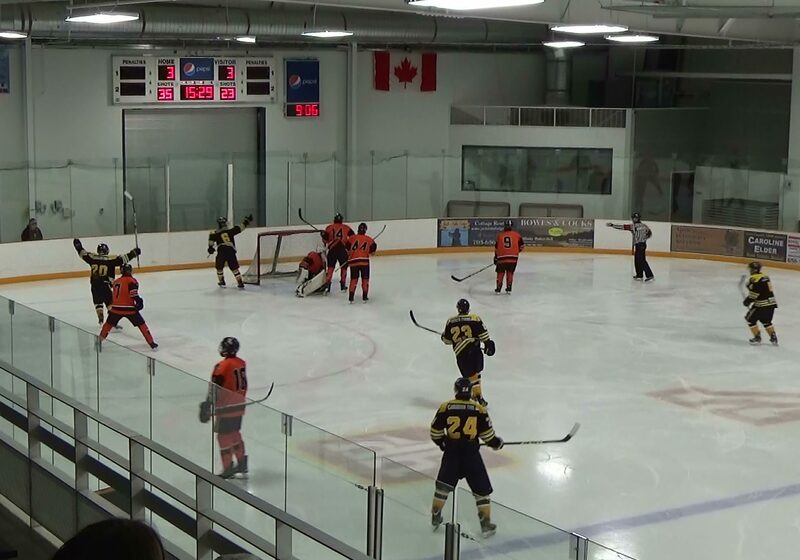 Uxbridge plays in Port Perry against the Mojacks on Sunday Oct.16th at 2:25 pm, and then host the Little Britain Merchants Friday Oct. 21st at 7:45 pm. Comments Off on Uxbridge Defeated by Little Britain 5-2! Uxbridge Defeated by Little Britain 5-2! Aiden Reilly and Damien Heinle were the only scores in the game tonight as Uxbridge fell 5-2 to the Merchants. Jake Joosten took the lost in goal as the Bruins record stands at 4 wins and 3 losses. Comments Off on A Come From Behind Win Over North Kawartha Tonight! A Come From Behind Win Over North Kawartha Tonight! (Photo: Jaiden Irven, Ryan McConkey Makes a save during action Oct.7/16). 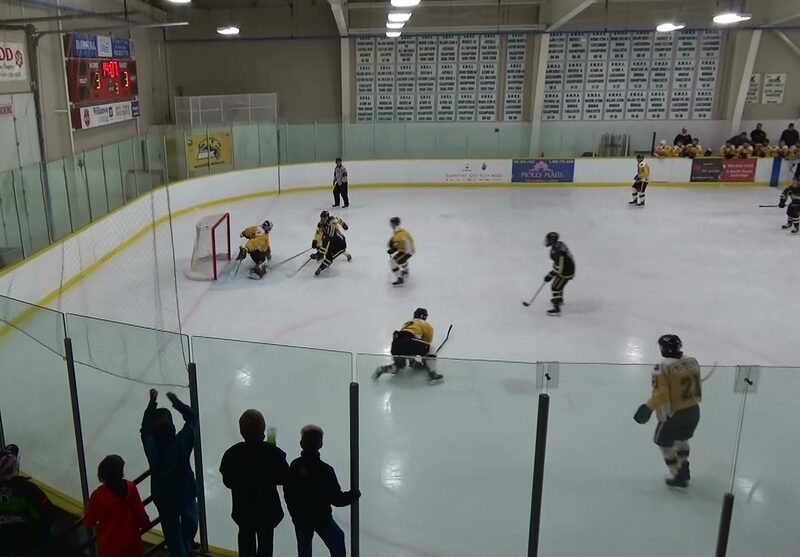 The Uxbridge Bruins scored the first and the last goals of the game against the North Kawartha Knights eking out a 3-2 win at the Bear Den tonight. Patrick Bolahood took a pass from Damien Heinle who was behind the Knights net and he buried it in the slot for 1-0 lead. The Knights then took over, tying it up before the period ended and took the lead in the second where it stayed that way till the third. Just 2:17 into the final frame Derek Dolan played give and go with defenceman Adam Bartholomew and walked in front firing a shot over the goalie’s glove side. Then it was a power shot from Bartholomew that found its way trough a maze of players for the 3-2 lead, Aiden Reilly fed a pass from the corner to set up the play. Ryan McConkey picked up his second straight win of the season facing 38 shots in the Bruins net. 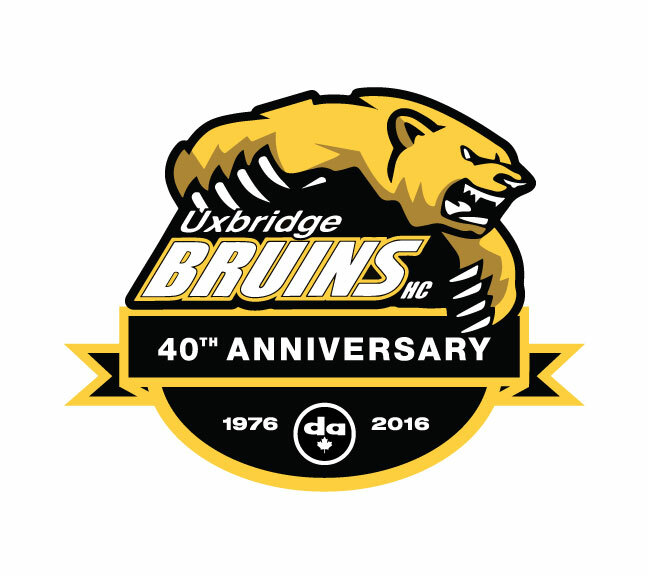 Uxbridge plays Saturday Oct.8th in Little Britain at 7:30 pm with a Tuesday game in Lakefield on Oct.11 also at 7:30 pm. The Bruins return to the Bear Den on Friday Oct.14th to host the Clarington Eagles at 7:45pm. Hope to see you there!